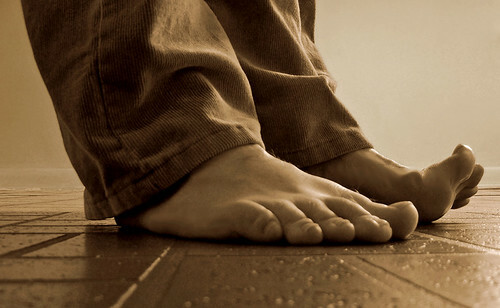 Why Do Feet Hurt So Much in Fall and Winter? Autumn is a painful time of year for many of our patients at The Center for Podiatric Care and Sports Medicine in New York City. When your feet are aching day and night, it can be difficult to think of anything else, so we really sympathize. Whether a person has diabetes, arthritis, bunions or another type of foot issue, there is never a good time to be dealing with pain. However, it’s especially difficult in the run-up to holiday season. With Halloween, Thanksgiving, Christmas, and New Year’s quickly approaching, it’s best to treat what’s ailing you now. In today’s post, we’ll explain why it seems foot problems are so prevalent this time of year, what the most common foot issues are, and how we treat them. During the summer months, people are wearing sandals, flip-flops, and walking around barefoot. The transition into a more confined shoe can be uncomfortable. Also, all those months of wearing shoes with poor support finally catch up with people. The cold weather tends to compound issues like stiffness, inflammation, and neuropathy as well. Wet boots bring new cases of athlete’s foot and toenail fungus. We see increased interest in elective procedures (like bunion surgery) in the fall and winter months for a variety of reasons — social calendars are less packed, holidays are coming up, insurance deductibles have almost been met, and people have time off work to recuperate if surgery is required. – Fallen arches: The primary tendon of the foot can stretch out and lose elasticity due to age, obesity, pregnancy, or inflammatory disease. While the loss of elasticity is permanent, you’ll find that wearing supportive athletic shoes and custom orthotics can go a long way. Braces that support the ankles can help too. – Achilles tendinitis: The Achilles tendon at the back of your heel can tighten and actually shorten with the overuse of high heels, obesity, or overuse in general. Rest, ice, compression, and elevation are good first-line defenses. Advil and wearing low-rise heels will get you over the hurdle. If you’re a chronic sufferer, you will need the heel immobilized in a walking cast and physical therapy. – Pinched nerves / neuromas: Tight footwear and repetitive pounding are responsible for a thickening of the nerve between the third and fourth toes. In addition to rest, ice, elevation, and over-the-counter anti-inflammatory medications, a metatarsal pad placed beneath the ball of the foot is recommended initially. If there is no response, you may need steroid injections or surgery. – Ingrown toenails: Trauma or improper nail trimming can cause the nail to grow into the skin and cause infection. At home, you can soak the toe in warm water, put antibiotic cream on it, and cover the injury with a Band-Aid. If the symptoms do not resolve within five days, a podiatrist can remove the damaged portion of the nail or apply chemicals so that the nail doesn’t grow back into the skin. – Heel pain: Small tears in the plantar fascia ligament along the bottom of the foot are caused by poor shoe choice, foot structure, obesity, or inflammatory disease. Treatment for plantar fasciitis is complex, but rest, elevation, ice, NSAIDs, arch support, and new shoes can help many people. Our NY podiatrist office is equipped to fit patients with custom orthotic shoe inserts and perform advanced therapies using radiofrequency waves. – Bunions: Genetics plays a big role in bunion development, but the condition can also be exacerbated by wearing tight, pointy, ill-fitting shoes. Our New York foot surgeons are some of the best in the area for bunion surgeries, skilled in many different procedures including the most minimally invasive techniques. We can also counsel you on shoe choice and padding, give you cortisone injections to ease pain, and discuss other conservative bunion treatment options. Remember, pain is not normal! So if you’ve been feeling activity-limiting pain in your feet and ankles that doesn’t abate with rest after a week, it’s time to contact The Center for Podiatric Care and Sports Medicine. We have an office in Manhattan and an office in Westchester for your convenience. We have all of the most advanced and high-tech tools needed to make an accurate diagnosis. From there, podiatrists, physical therapists, and podiatric surgeons are part of a well-rounded treatment plan. Book online.